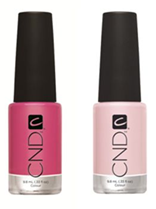 September 13, 2011 - CND pioneered nails as accessories on the runway, and for Diego Binetti, nails are a true statement piece. So ladies and gents, please grab your disguises - we're on our way to a masquerade ball! At Karen Walker, Wanda Ruiz custom blended "Murky Mustard" manicures using CND Colour in Bicycle Yellow with 7 drops of CND Colour in Blackjack for a summery, spirited and youthful shade. Fresh faces with poppy orange lips and Victorian twisted hair made it almost possible to hear the songbirds tweeting!